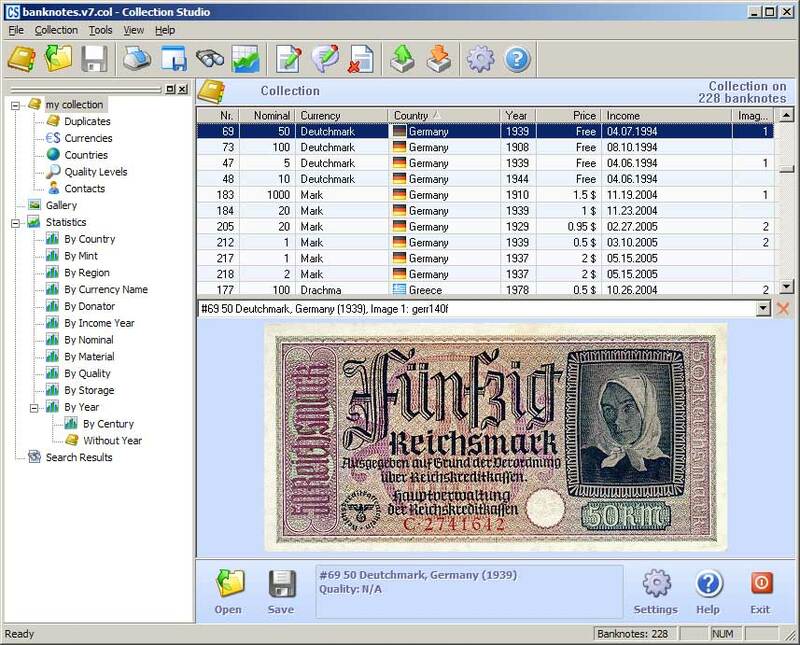 Collection Studio is a program which tracks your collection items such as coins, banknotes, stamps, posters, etc and shows the whole or partial collection with different points of view. Easy-to-use tools will help you to change information, share it with friends, allowing collection to grow. It help you to change information, share it with friends, allowing collection to grow. Supported collectibles are coins, banknotes (paper money), books etc. * Import and export feature. * The Collection Studio database comes pre-populated with hundreds of URL links relevant to your collection, where you can easy find out required information on banknotes, coins, issue series, etc. * Powerful search tool allows you to find out all items that match various search query parameters. * Explicit export tool, that allow save your collection in various file formats (HTML, RTF, CSV, XML, ASCII Text File). * Amazing View feature allows you to view your collection in many different ways. * Multi-lingual support (20 languages). * Inner URL database (400+). Platinum Collection contains 7 wonderful games. Qweas is providing links to Collection Studio 3.62 as a courtesy, and makes no representations regarding Collection Studio or any other applications or any information related thereto. Any questions, complaints or claims regarding this application Collection Studio 3.62 must be directed to the appropriate software vendor. You may click the publisher link of Collection Studio on the top of this page to get more details about the vendor.